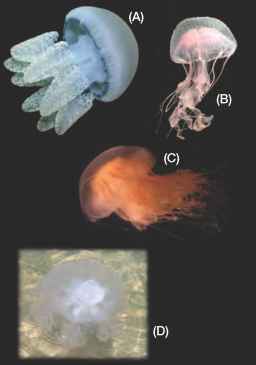 Jellyfishes of the GBR fall into two phyla, the Cnidaria, or medusae, and the Ctenophora, or comb jellies. Most zoology textbooks give a good account of the classification and morphological differences between the two phyla. 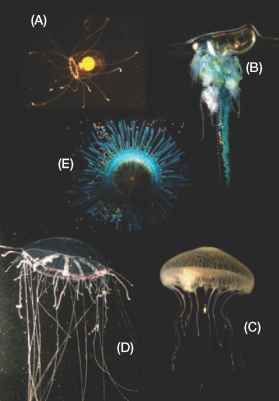 Other gelatinous zooplankton include salps, or pelagic tunicates in the Phylum Urochordata; these are not dealt with in this chapter (see Chapter 14). • Hydroid jellyfishes (Class Hydrozoa, Figs 18.1, 18.2). 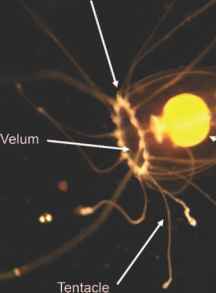 Hydroids are characterised by having small, clear bodies with a shelf-like velum, gonads on the radial canals or manubrium; and they lack true oral arms (e.g. Obelia, Aequorea, Craspedacusta and Physalia). • True jellyfishes (Class Scyphozoa, Figs 18.3, 18.4). These are characterised by having usually large, fleshy, colourful bodies, a greatly reduced velum, and gonads in internal pockets; the Rhizo-stomeae (blubbers) have eight oral arms and they lack marginal tentacles, whereas the Semeostomeae (sea nettles, moon jellies and their kin) have four oral arms and well developed marginal tentacles (e.g. Chrysaora and Aurelia). Cassiopea spp. are ben-thic rhizostomes that spend most of their time upside down, that is, lying with the umbrella down and oral arms up, gently pulsating water over their algal symbionts. 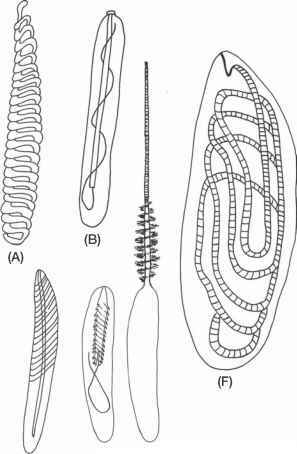 the Carybdeida (Irukandjis and jumbles) have a single tentacle on each unbranched pedalium, whereas the Chirodropida (box jellies) have branched pedalia, with each branch leading to a tentacle (e.g. Carybdea, Chironex and Chiropsalmus). • Order Platyctena (Coeloplana, Ctenoplana), which look like a creeping, gliding, or swimming flatworm with two tentacles. 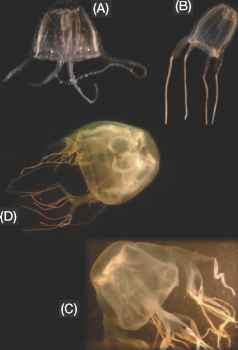 jellyfishes, were fully developed by the Pennsylvanian (about 300 Mya). Currently, well over a hundred jellyfish species are recorded from the GBR region. Many of these species, however, are still awaiting formal classification. Most are tiny and inconspicuous hydromedusae, presenting no serious medical threat, giving a 'sea lice' sting at the very most. However, they may at times occur in such dense aggregations that visibility may become severely diminished and even minor stings become annoying if in large number. Furthermore, Irukandji jellyfishes are often found aggregating with dense swarms of salps (pelagic tunicates, see Chapter 14) and hydromedusae, so it is advisable to take extra safety precautions or not enter the water on days when there are dense gelatinous zooplankton blooms.